WE GET TO WORK ON THE THING. UX Accounting Finance Back End DevOps These people are all super important. But they don't work directly on the thing. Without any of the stuff we're going to talk about today, FED’s are already very powerful. Without any of the stuff we're going to talk about today, ๏ UX is in our hands! ๏ Performance is in our hands! ๏ Accessibility is in our hands! ๏ Execution of the design, animation, and interaction is in our hands! FED’s are already very powerful. You can make an awesome lifelong career out of this. HTML CSS JS The FRONT END DEVELOPER SKILLSET only starts being LIMITED when you need custom back end development and server ops. “Serverless” doesn't mean there aren't servers involved. ! ere will always be servers involved. ! at's what the internet is. ! PUBLIC SERVICE ANNOUNCEMENT: THIS CAVEAT IS REQUIRED TO BE INCLUDED ANYTIME ANYONE SAYS SERVERLESS FOR THE NEXT TWO YEARS. ! today. Let's not try to define it right now because it's hard and that's boring . Instead, know that everything we talk about today combined is basically serverless. Let's look at one of the major ingredients. Cloud Functions aka " Functions as a Service " URLs! Use case for Cloud Functions SAY YOUR THING NEEDS TO SEND A TEXT MESSAGE. Say it's a recipe site and sending a text is a quick way to share a recipe with a friend or yourself for quick access. Welp. That's where my front end skills stop and someone else's back end skills will need to come in. Some API's don't need keys, or the keys don't need protection. When your API key unlocks the ability to send an SMS message, it matters. Bad guys would love to steal that API key to use for evil. This is what we're not going to do. Not because this is bad , but because we're looking at serverless options on purpose . WAIT A SECOND! Isn't our recipe site already running on a server ? Why can't we just use that? We maybe could. But it's increasingly popular to use a static file host . And a damn fine idea! Why? • Very inexpensive (or free) • Very fast (CDN) • Very secure • Very front-end developer friendly • HTTPS, Git, Modern Build Process Wonderful at hosting static files. Don't run any backend languages. On purpose. Webtask is kinda like CodePen, but for cloud functions and minor data storage. I can run it and see what I get. <form method=" POST " action="https://wt-8081b26e05bb4354f7d65ffc34cbbd67-0.run.webtask.io/twilio"> <label for="tel">Number to SMS to:<label> <input type="tel" name="tel" id="tel"> <input type="hidden" name="message" value="Whatup." > <input type="submit"> </form> Just HTML! You'd probably call this progressive enhancement. UGGGGHGKH THIS IS COMPLICATED. " SOME THINGS ARE AND SOME THINGS AREN'T. Some problems are easier to solve SAY YOUR THING NEEDS A DANG WEB FORM. Like you need to ask some users to register for an event. Dolladollabillz SAY YOU NEED TO TAKE MONEY FOR SOMETHING. You want to sell custom scarves, tickets to an event, or your time. Stripe even gives you a nice on-page checkout experience for free. Still needs to talk to a backend thing. Like, say, a cloud function. Speaking of which, browsers are stepping up their game here as well. The Web Payment API is essentially free check out UI/UX. The Situation Room SAY YOU NEED COMMENT THREADS. Paragraphs are the ultimate currency of the internet. But a traditional WordPress site with a MySQL database doesn't lend it self particularly well to this whole Serverless thing. that go along with it. But traditional databases don't go inside repos, so how are we gonna handle comments (and the structured data) if we go down this road? AWS Lambda is a cloud function service , just like we looked at with Webtask and Azure cloud functions. Lambda is probably the biggest player . Less PostCSS Markdown Pug Babel Stylus Sass Slim Haml Cheaper! Easier! Faster! Don't break! Airtable has very powerful and modern spreadsheets and forms. And great CRUD APIs! YOUR SITE NEEDS TO SEND NOTIFICATIONS Like modern websites do . Say it's a bug tracker application. When a bug happens, it should trigger a Slack notification, email, and SMS. Bug happens! Send Slack notice! Send email! Send SMS! As a front-end developer, not only can you design that experience, but you can make it work. These are jobs for cloud functions! Webtask Azure Cloud Functions Firebase or Google Cloud Functions AWS Lambda Hitting APIs with secret keys? Hitting webhooks with JSON? Let's look at our little baby infrastructure. Using a "traditional" CMS like WordPress, CraftCMS, or Perch is a classic solution to this. Static site generators tend to edge a bit too nerdy . Everyone can learn, but you gotta admit learning Markdown and text editors and Git and all that is a bit much to change a phone number. A newer version of that by Lea Verou. "Headless CMS" A CMS that has no front end at all. It just exposes content via API. Cloud-Managed Headless CMSs Gives people a CMS with a UI, but delivers content via API so you can work with serverlessly. SERVERLESS We'd be " er wrap this up. SERVERLESS ! ere are security benefits How do I protect and back up my database? What file permissions should PHP files be again? Where do I keep my secrets? What are breach points I should be extra careful about? Why is this my job? Serverless isn't 100% better all the time for everything. If you don't like it or it isn't right for, no big deal. Knowing about things is pretty valuable. 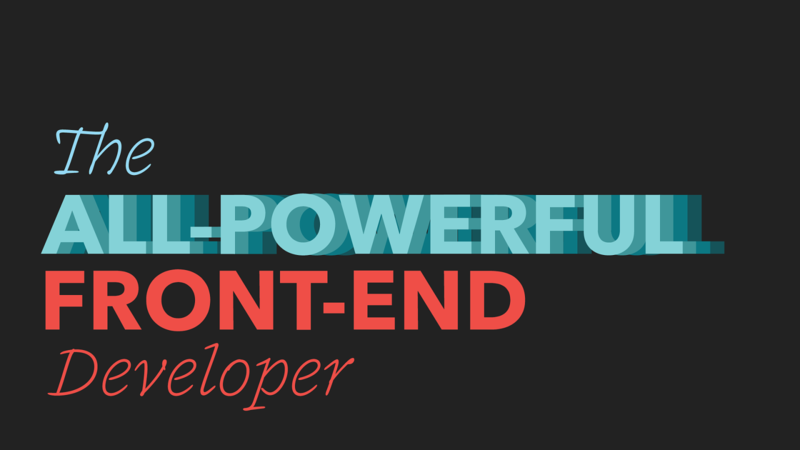 View The All-Powerful Front-End Developer on Notist. The internet is, without metaphor, just a bunch of servers tied together with wires. Without servers, we'd have no way to share our creations with the world. Yet, in a bit of a paradox, servers are <em>less</em> essential to our work than they've ever been. We can now do things on the front-end that used to require a back end. When we do need a backend, our front-end skills can be put to work, giving us some surprisingly powerful new abilities. It's kind of a phenomenon. Let's get one thing out of the way: it still involves servers, so that word serverless might feel a bit disingenuous. It's actually a new way to pay for and work with servers that, in many cases, is cheaper and easier than buying and managing your own servers. Web developers of all kinds can take advantage of it, but this site is particularly interested in how it relates to and helps front-end web developers. Here's one way to think about it: you can take your front-end skills and do things that typically only a back-end can do. From large size/responsibility to smaller focus/fewer things you own to go wrong. What a great conference! Until next time, #frontendconf!